Looking for a creative new way to decorate your home or office with greenery? 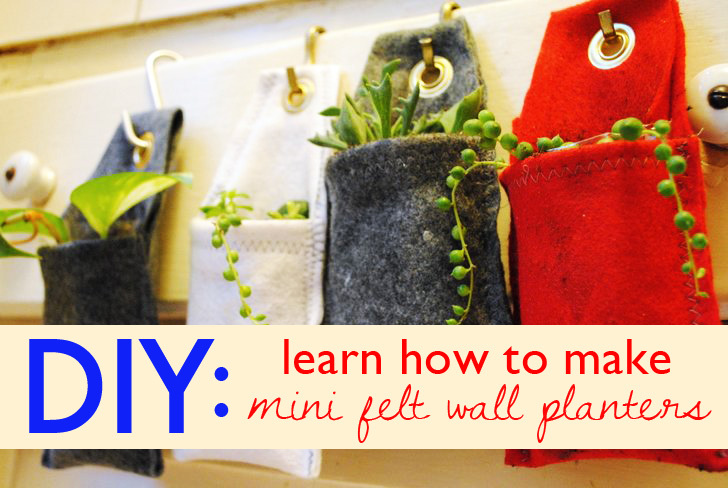 Sew your own mini felt wall planter and hang a plant anywhere! With this fun DIY project, you can create a colorful felt miniature planter with just a few simple items—many of which you can find in your home or at your local craft store. 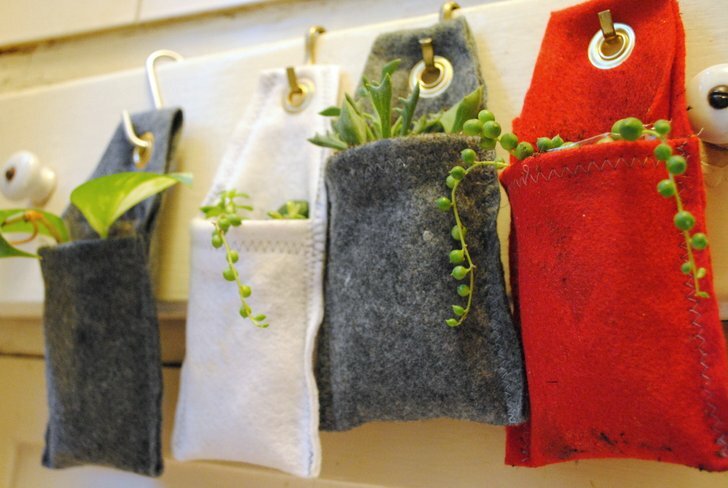 Hang your mini planter in your office cubicle, line a few up in a row along a windowsill, or use s-hooks to hang them around your house! 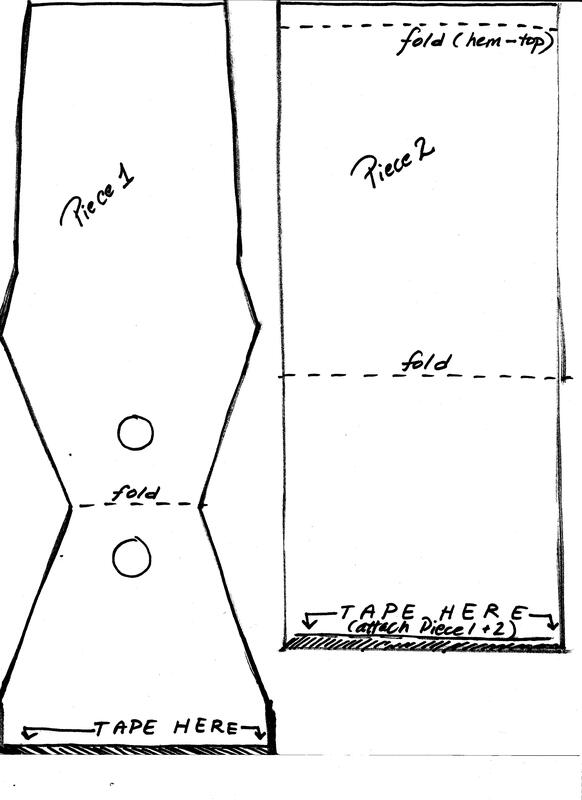 Print out the pattern on one sheet of 8.5 X 11 inch printer paper, cut out, and tape together the two pieces. 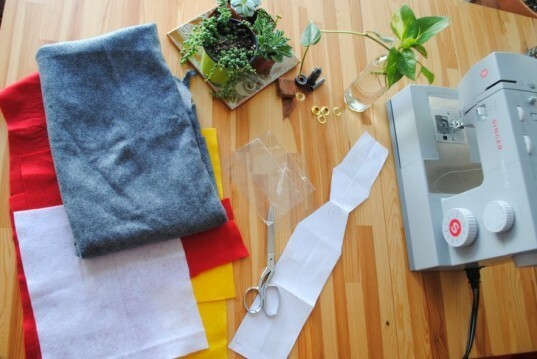 Use the pattern to cut out your felt. If your felt piece is not long enough, you can sew two pieces together to create a 21 inch piece. Fold the edge of the planter (the 4” side, not the tapered side) over narrowly and stitch down the hem. 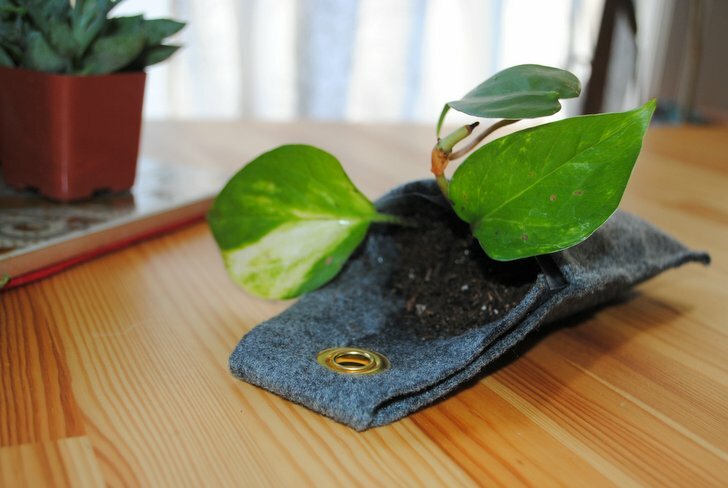 Next, fold the felt planter piece together and sew the two side seams as shown. Make sure you don’t sew the tapered flap into the side seams. Take the plastic bag and tuck the tapered flap inside the bag (this hides the bag, helps anchor it inside the planter, and helps water the soil and keep it damp since it is absorbent.) Use your fingers to tuck the plastic bag inside and flatten it down in the pocket of the planter. Use a marker to indicate where you want to place the hanging grommet. Install the grommet according to the directions on your grommet tool. Using a spoon, gently fill the plastic bag inside the pocket of the planter with potting soil about 3/4 full. Choose the plants you’d like to add to the planter and gently ease them out of their pot and separate their roots. Carefully add your plants to the potting soil and use your fingers to add several more pinches of dirt around the plant, gently tamping down the soil around the plant. Use a thin stream of water from the tap or a glass to add a small amount of water to the newly planted greenery. When you water the plant, be sure that any water you add doesn’t spill above or over the plastic bag—this will ensure your mini planter remains waterproof and can be hung directly on your wall or in your office! Last, but not least, you will need a selection of plants for this project. Succulents and vines work well. We used "String of Pearls", a succulent, "Golden Pothos", a vine, and "Little Gem", another succulent. Step Two: Cut out the pieces of your planter. Print out the pattern on one sheet of 8.5 X 11 inch printer paper, cut out, and tape together the two pieces. 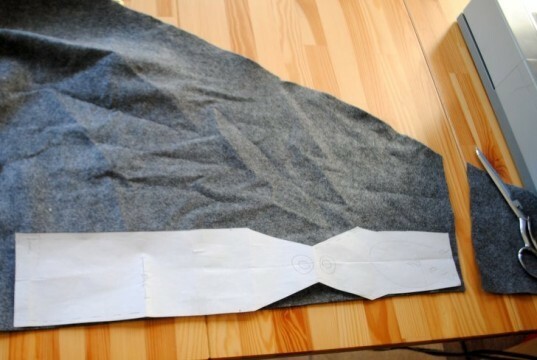 Use the pattern to cut out your felt. 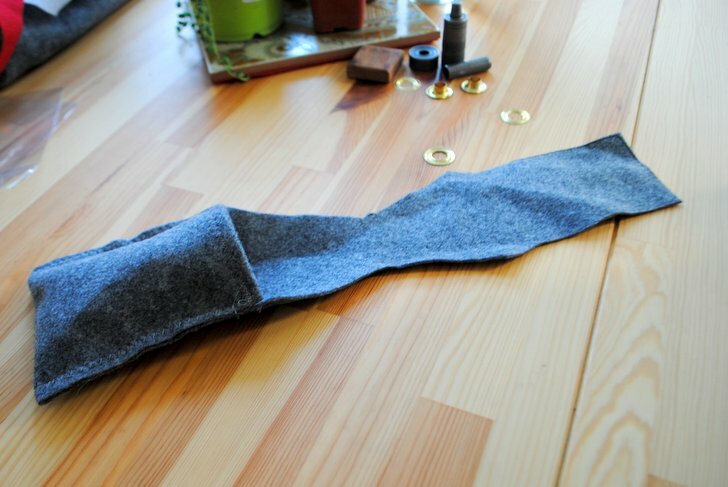 If your felt piece is not long enough, you can sew two pieces together to create a 21 inch piece. Step Three: Sew the planter together. Fold the edge of the planter (the 4” side, not the tapered side) over narrowly and stitch down the hem. 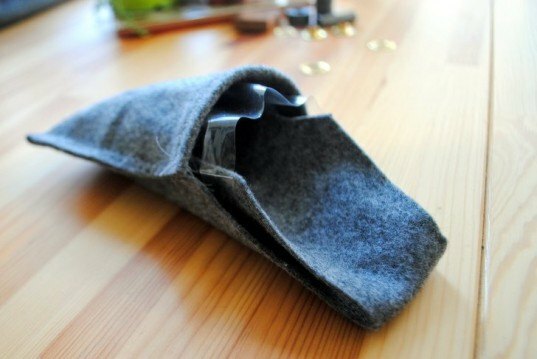 Next, fold the felt planter piece together and sew the two side seams as shown. Make sure you don’t sew the tapered flap into the side seams. Use your fingers to tuck the plastic bag in and flatten it down inside the pocket of the planter. Mark where you would like to install the hanging grommet and install it according to the directions on your grommet tool. Step Five: Add greenery! Using a spoon, gently fill the plastic bag inside the pocket of the planter with potting soil about ¾ full. Choose the plants you’d like to add to the planter and gently ease them out of their pot and separate their roots. Step Five: Add greenery! Using a spoon, gently fill the plastic bag inside the pocket of the planter with potting soil about ¾ full. Choose the plants you’d like to add to the planter and gently ease them out of their pot and separate their roots. Carefully add your plants to the potting soil and use your fingers to add several more pinches of dirt around the plant, gently tamping down the soil around the plant. Use a thin stream of water from the tap or a glass to add a small amount of water to the newly planted greenery. When you water the plant, be sure that any water you add doesn't spill above or over the plastic bag – this will ensure your mini planter remains waterproof and can be hung directly on your wall or in your office! Now you can make one in every color to decorate your home or office or make one to give to a friend!